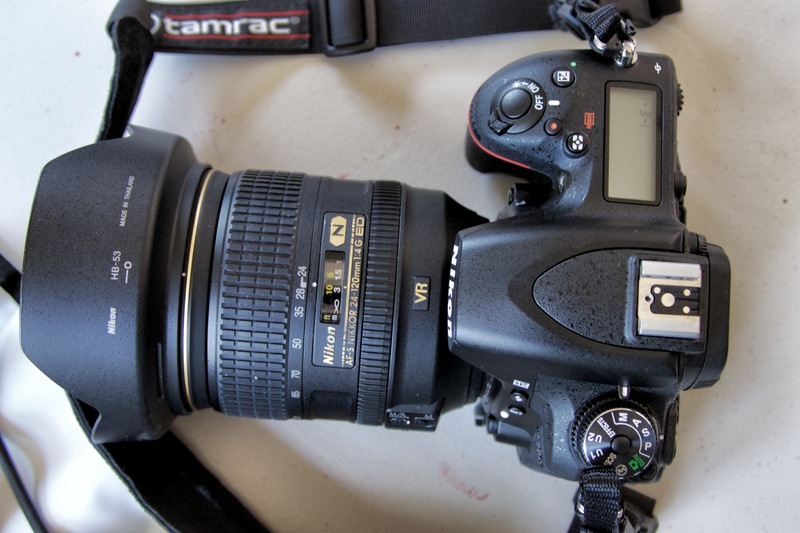 Good working tools for an event photographer. Going traditional. I just finished an event assignment and I know there are some readers who are interested in what kind of gear an I used on the job and why I made the selections I did. I'm sure the vast majority of our VSL readers are not the least bit interested in gear but I do like to indulge the tiny minority who believe that the gear influences the shooting and the shooting is an influence on what gear you pack and bring to the job. Writing about what I just used helps me either confirm that I did as well as I could or, make me realize that I may have fallen short and might want to reconsider what I drag around with me next time. To set the stage most of the four and a half days were spent walking around in ballrooms, restaurants, bars, and conference rooms as well as in reception rooms at a race track, in the grand stands and on the Formula One track. In almost every situation the goal was to document people. Small groups of people. Couples. People on a step-and-repeat background with a band, groups of four or five in the grand stands, couples in a fine restaurant with the ambiance of the space and the group behind them. I also photographed some interior spaces and the set up and display of some amazing food. With the exception of portraits taken on the first day there was never a light stand or tripod in sight. Everywhere I went and everywhere I shot I needed to be able to work in with just the gear I could carry. If I couldn't carry it for hours at a time I left it in the car. That should set the stage. Let's start with the small piece of gear up above. It's a pack of filters that Rosco put together for all the fans of the Strobist.com website. 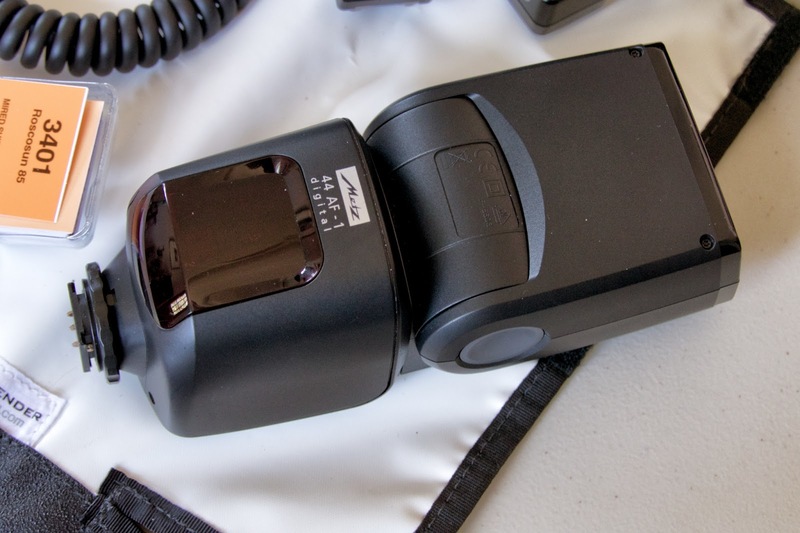 It has pre-cut color correction filters that fit directly over the front face of most battery powered strobes. The filter kit includes a range of CTO filters, including an 85 which is a full correction of daylight flash to 3200K tungsten. The filter pack also includes "plus greens" and CTB filters. I bought the collection of filters years ago and was delighted to find that the most popular ones (the ones I like) have included duplicates. 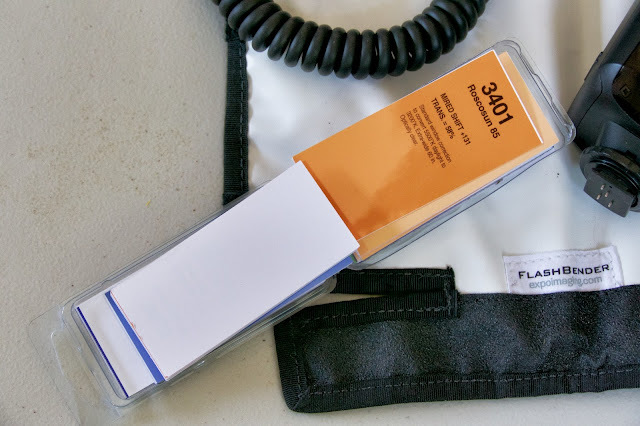 Handy for multiple flashes or just as back ups for what is, ultimately, an expendable. When I am working in a restaurant, bar or other venue with true incandescent lights I like to put an 85 filter on the flash to get the overall color temperature into the same range. Most dim incandescent lights are between 2600-2900K so there's still a gap between the color temperatures but it's not so obvious and jarring and means that ambient light can be used as non-polluting fill light! Fun and games. A good camera and flash do all the necessary exposure calculations so I just sit back and enjoy images that are more neutral, overall. The filters would be pretty useless without a flash to put them on so I brought along a dedicated flash for the Nikon DSLR cameras. It's not a Nikon brand flash but it also doesn't have a thermal protection circuit that's more protective than a mother bear and it cost about half of what one of the better flashes from Nikon costs. It's not as flexible in use but it certainly serves my purposes for event work. Here's why: Even though it takes four double "A" batteries it's lighter and smaller than the big Nikon flash units. It meshes with the D750 pretty seamlessly. By that I mean the TTL works well and I'm rarely ever surprised by the exposures. It has a good, powerful AF-illuminator which is a red pattern instead of a white light. It swivels and bounces. The output is lower than the max you can get out of the bigger Nikons but that also means it sips batteries at a much reduced rate. 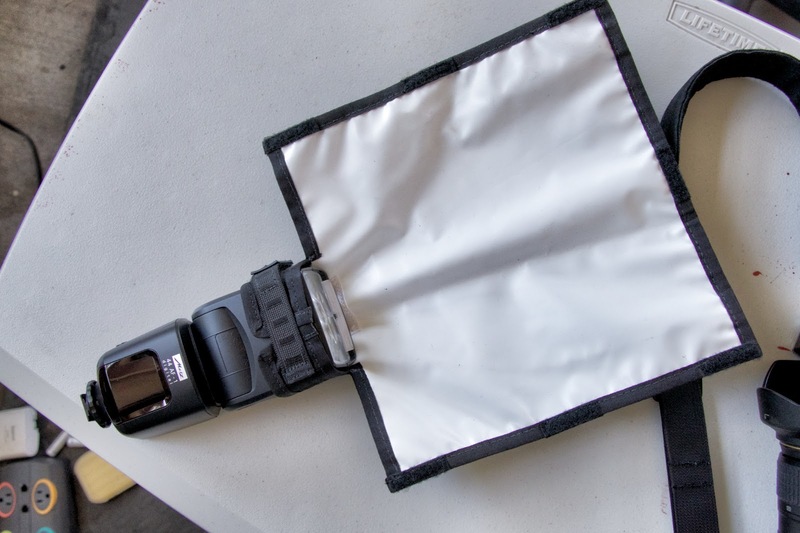 It's pretty common for me to use this flash with a diffuser, a reflective modifier or just bounced and still get 350-500 flashes out of one set of Eneloop batteries. Nice not to have to worry about quick changes in a crowded and noisy venue. When I use on camera bounce or modified flash I try to keep the flash exposure 1.5 to 2 stops above the ambient light. If my flash is too bright the room goes to dark. If the flash is dialed down too far there's a lot more change of mixed light ruining the look of someone's complexion or of capturing camera and subject movement by "dragging" the shutter. Phottix off camera cord, SC-28. 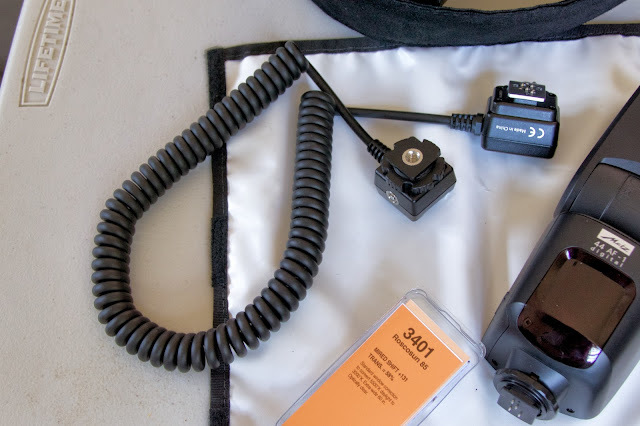 I always carry my ancient Phottix off camera cord with me because if I use a diffusion dome on the flash (but never a Gary Fong Tupperware cup...) I like to get the flash up as high as I can reach and direct the flash over to one side (usually my left). This cord was bought as a cheap alternative to the Nikon product and I always meant to buy the more expensive one down the road but this one has been amazingly resilient. Doesn't matter what brand you use but in many, many situations getting that flash off the top of the camera just makes the lighting look so, so much better. I am grudgingly impressed with the cord and I just noticed it does have a metal shoe! The event camera. The D750. I'm having a mini-lovefest with this camera this week. I shot several thousand images with it and less than 5 % required much tweaking in Lightroom to make them highly acceptable or perfect. I like this camera because it does nice Jpegs. I've been using it in the 13.x megapixel mode (medium size) because it's almost unheard of for a client to want to use an event photograph of clients for anything more than a commemorative print, an image on an event gallery or included in electronic collateral for the following year. Translated, that means most of the images could be well shot at 6 MP but I like a bit of comfortable security so I opt for the middle ground. If things are vital and not re-shootable then I'll switch to raw but that's getting rarer and rarer for me in event situations. When I use the D750 this way the downsampling in camera seems to create smoother tonalities and less noise in the files. Score! I can store more of them on every card. Score! They take much less time to post process and export, as well as less time to upload into galleries. Yay! On another score, the D750's flash technology is pretty mature so it meshes well with portable flashes in automatic modes. The D750 is also just the right size to use as a flash+camera imaging platform. Smaller cameras feel dwarfed by big flashes and small flashes yield harder light and work less well with diffusers like the Flashbender. Finally, in "group" mode AF the camera is surefooted with center area, S-AF autofocus. So, the images are sharp, tasty, in focus and well exposed. Just what I want. The final feature? The battery for the camera will take me all the way through a typical event shooting day. Go camera. 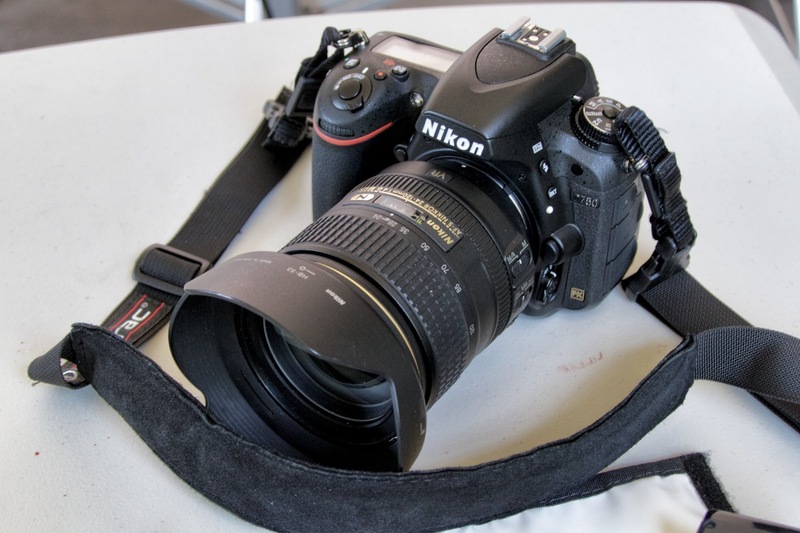 The Nikon 24-120mm f4.0. Current version. I've tried event photography with everything from Hasselblads and Leica Ms to Panasonic fz 1000s and everything in between. It all comes down to the lens. The right lens can make your day or evening of event shooting comfortable and straightforward or turn you day into a nightmare of juggling optics on and off a camera. While there are sharper and better corrected lenses out in the world I'm happy with this compromise. It's actually more than sharp enough for any kind of event work that revolves around people so I don't ever ding it for sharpness. In fact, this past week I shot close to wide open at a lot of the focal lengths and didn't have any issues at all. Now, if you are an architectural photographer this puppy will have you running out of a room screaming. At the wide end the barrel distortion is right there in your face. Even after turning on the in camera distortion correction or working with the profile in Lightroom there is some residual wonkiness. If I use the lens for the purposes it was designed then I have no complaints. If the bulk of my business was straight lines I'd be looking at the new, Sigma 24-35mm f2.0 Art lens instead. Or maybe one of the better corrected, single focal length lenses. But what I love about this one is that I can go from big group to tight head shot without much effort, and I have a reasonable assurance that the lens will work well in both circumstances. If I know that I'll be at a big conference with speakers on stage I will add an 80-200mm f2.8 to the mix. But lately I"ve been experimenting with using this lens (24-120mm) along with the DX crop in the D810 instead. That yields me a 180mm focal length and still delivers good pixel density in the range of 16 megapixels. It may be the perfect all around event tool but the D810 is bigger and heavier than the D750 and not as good as ISO6400. To top it all of the whole combination, along with extra camera and flash batteries, a back up lens and bits and pieces, pens and notebooks, all fit into one small, moss green, Tenba backpack. It's comfortable to carry and does a good job of protecting the gear. When you can show up and do a good job with the contents of small, comfortable, not too heavy backpack you've figured it out well. Do I need more back-up gear? It's rare to have a camera or lens go down but I've always kept an extra body and lens in the car. Now I'm starting to use the fz 1000 as a back up instead. Smaller overall package but still ample performance in a pinch. Just another day at the "office." 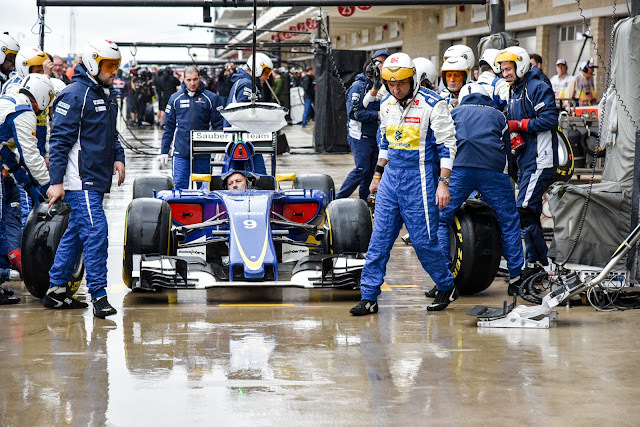 A shot from the pits at the Austin F1 Grand Prix. Walking through the pits with a Nikon D750+24-120mm f4.0. Though I had on a rain coat and was holding an umbrella the rain was a 360 degree, immersive experience and I was soaked to the bone when I got back to our suite at the Paddock Club. The camera and lens were both thoroughly soaked but worked fine and continue to work. The weatherproofing that camera makers have been implementing really does seem to work. The preliminary rounds of the F1 were canceled on Saturday but the rain finally broke on Sunday and the race scheduled the prelims and finals on the same day. I was not there to photograph the cars or the race but to support a corporate clients whose sales event was partially wrapped around F1 festivities. As the photographer for the business event I worked four very long days and evenings. On Saturday night I was making prints until 4 am for a next morning delivery. But I got to see lots of fast Porsche races before the main event, had a spot just over the finish line from which to see the race and had dinners in some of Austin's finest restaurants --- always with my camera right next to me. A fun and entertaining weekend of "work." Now we're back to normal life. I've vacated my provided room at the Four Seasons and have made it back to my own neighborhood and, more importantly, our swimming pool. It was beautiful. With the warm up and some other sets we managed to plow through 3100 yards this morning before most people had their coffee in hand. Nice feeling. I missed that over the weekend. I had the coffee; no problem, but the swims were nowhere to be found. Back in the groove and happy about it.